WINNER TAKES ALL in our Baby Month Extravaganza! 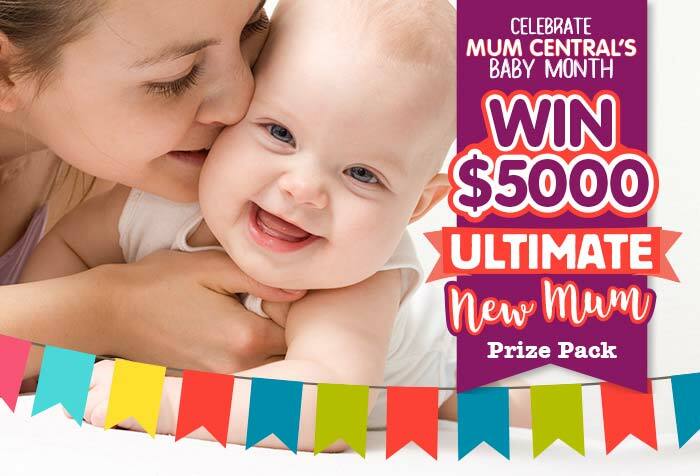 WIN Everything a New Mum Needs Worth Over $5000! Hold on to your gorgeous preggy belly Mumma, things are about to heat up! It’s Mum Central’s Baby Month and to celebrate, we’re delighted to launch our most show-stopping giveaway ever! Jam-packed with absolutely everything (and more!) a new family could need, you won’t believe what one lucky winner will score. Valued at over $5000, this is a collection of the coolest, latest and best products on the market. From the must-haves to the lust-haves, one lucky mum will scoop the pool and walk away with the lot. It’s the ultimate new mummy’s starter kit! Read on for everything you need to know about what you could win – and how to get in the draw! It could just be your lucky day! 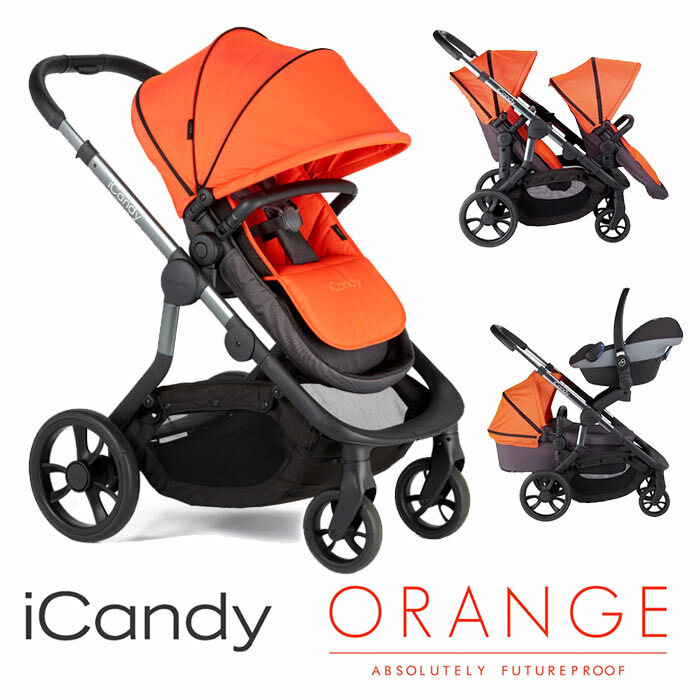 iCandy is the sought-after pram brand and our lucky winner will be strutting her stuff down Main Street with a fabulous ‘Orange’ pushchair (RRP $875). Described as ‘absolutely future proof’, this state-of-the-art pram is designed to grow with your family. It boasts a 64-litre shopping basket, swivel bumper-bars, integrated buggy board, chic leatherette detailing, gorgeous stylings and a 2-year warranty. Be warned, you’ll certainly be turning heads with these new wheels! Every mum needs a fabulous nappy bag. Isoki have successfully fused both style and practicality to offer nappy bags that are much as a fashion statement as a way to lug all bub’s gear. 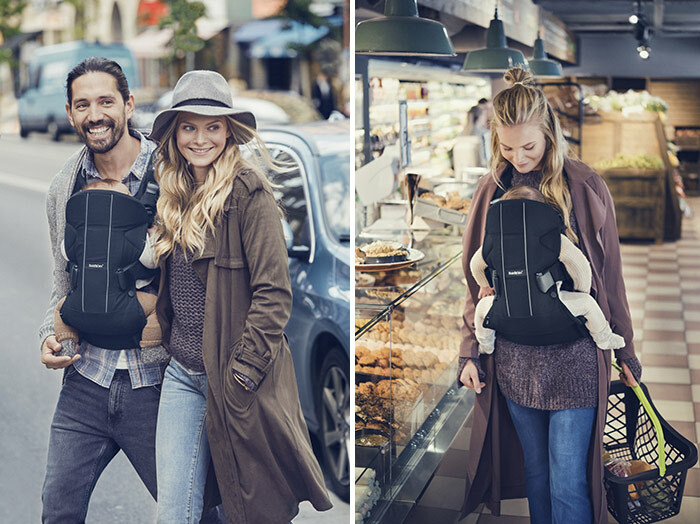 BabyBjorn Baby Carriers are absolute lifesavers, and there’s a reason so many mums simply swear by them! When you want to get ‘out and about’ pram-free, they’re ideal. They’re also super comfy to wear, distribute bub’s weight ergonomically, are designed to protect baby’s hips and can be used from newborn up to 3 years of age. You’ll soon declare your Bjorn the product you just can’t live without! A beautiful baby bed is the cornerstone of every nursery! 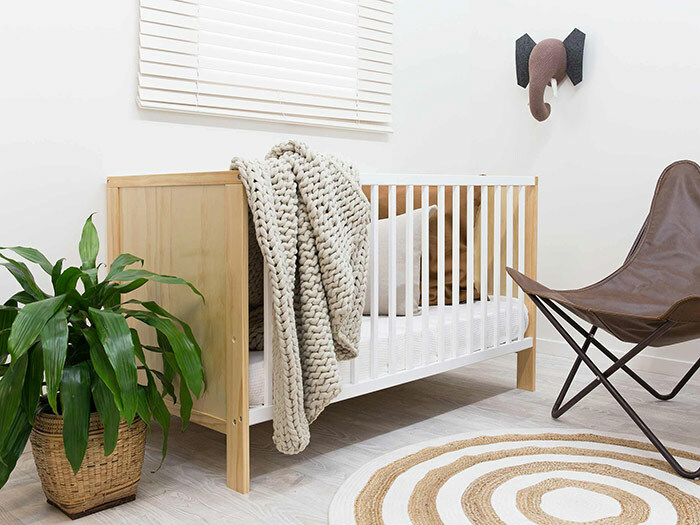 Our lucky winner will adore the designer-looks of the Mocka Aspiring Cot (RRP $189.95). Combining Scandi-lines, a gorgeous two-tone finish and the peace-of-mind of all-sides-fixed for added safety this is a crib made for dreaming! We can’t guarantee your baby will be a good sleeper, but we know you’ll never tire of admiring this beautiful cot! Mums around the world rely on Britax to protect their most precious possessions on the road – their little people! When it comes to the highest level of car seat safety, Australia chooses Britax. 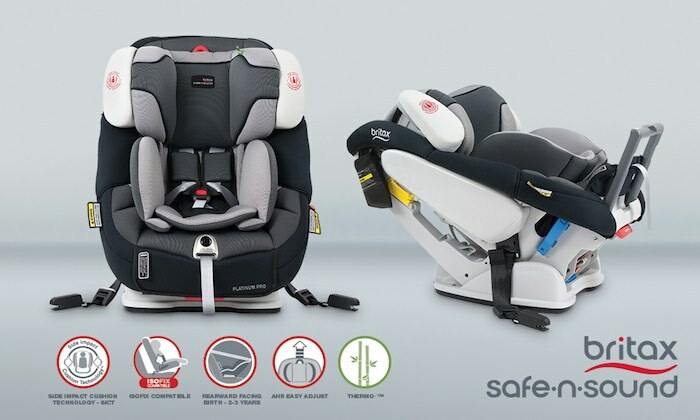 The Britax Safe-n-Sound Platinum PRO™ is their most advanced convertible car seat ever. Suitable from newborn to four years it’s loaded with innovative features including ISOFIX compatibility, Side Impact Cushion Technology (SICT™) and Thermo5™ high-performance fabric with Bamboo Charcoal. Valued at $759 our lucky winner will appreciate the quality, comfort and protection only Britax Safe-n-Sound can provide. Known for their distinct quality, style and attention to detail, British label Boden is online baby-clothing heaven. 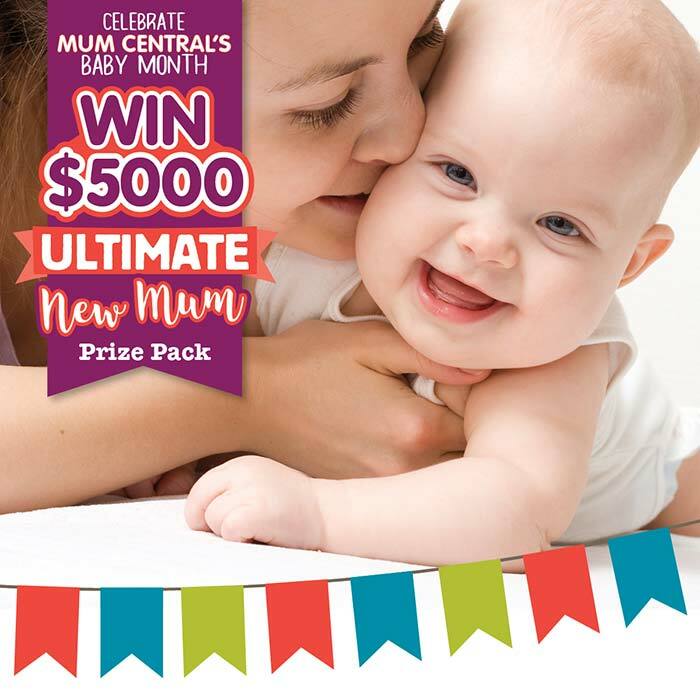 Our lucky winner will be the mother to the most adorable, mini fashionista on the block with a $500 baby clothes bundle to be won. Even better (or maybe the hardest part of all!) 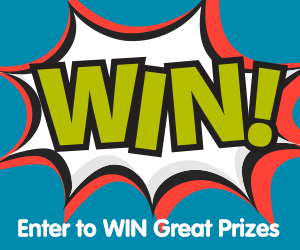 is this prize is a voucher – so you get to do the choosing. You’ll be hard pressed to decide when there are so, so, so many divine pieces on offer. Baby Boden wraps up new arrivals in the softest baby clothes with aww-worthy machine-washable details. With adorable details, snug knits, practical yet sweet rompers and a vast range of accessories you’ll no doubt have the best-dressed kid in town! A timber high chair brings so many benefits. It looks stylish in your home, it’s easy to clean with no fussy fabrics and is hard wearing for long-term use. 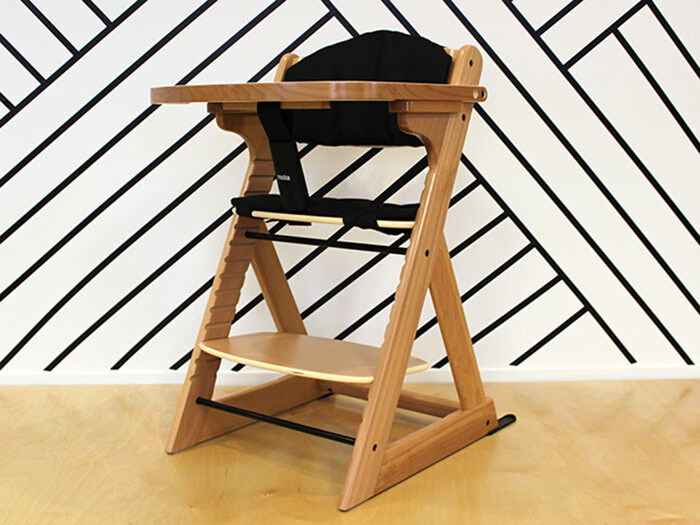 Mocka’s original and loved product, a Mocka high chair (RRP $149.95) combines sleek design with real practicality. Including an adjustable footrest and a removable tray, this piece will grow with your child. Of course, it meets Australian Standards and comes with an ultra-safe over shoulder harness. Our lucky winner will appreciate this piece well beyond their little babe becomes a curious child. A comfortable nursery chair is imperative! There’s not a mum around that hasn’t spent at least one, long night nursing their baby through the wee hours. That’s why a nursery chair must be as comfortable as it is stylish. The Asta Rocker by Mocka (RRP $119.95) is sure to tick all the boxes. Featuring a blonde, Birch wood frame and a chic padded seat in a variety of colours, there’s one to suit every nursery theme. Of course, long after your nursing days are done, the Asta will seamlessly integrate to another space in your home. No doubt, it’ll be the best seat in the house! There are certain brands that mums always know they can rely on. Our winner will enjoy four of these classics with gifts from some of every mum’s favourite brands. You’re covered for weaning with bowls, spoons, cups and even wipes for the post dinner mess from Heinz Baby Basics. When it comes to play-things they’re definitely not all created alike! 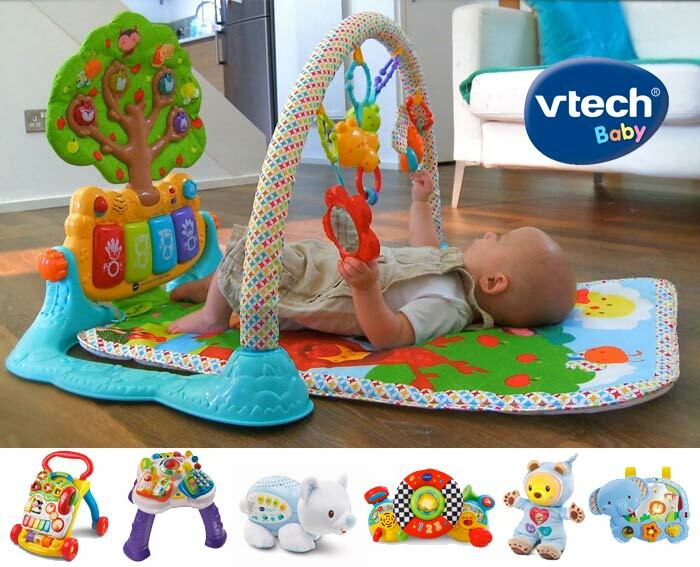 Vtech is an award winning electronic learning toy developer, renown for their amazing, interactive and engaging designs! The only problem with being the owner of so many fab toys? Everyone will want a play date at your place! 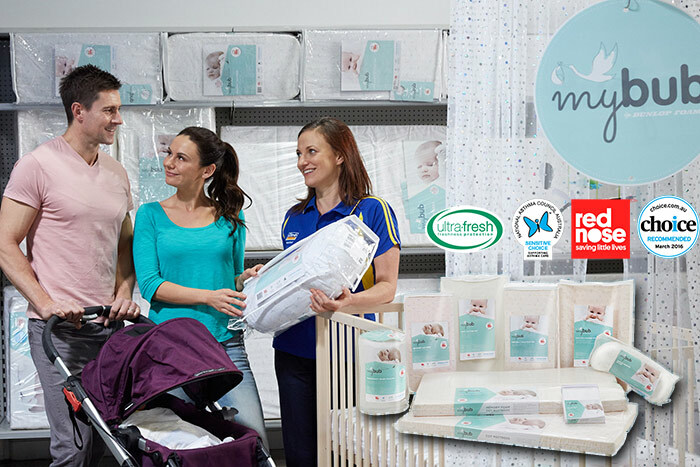 The only nursery range in Australia to be endorsed by Red Nose and recommended by CHOICE in 2016, Clark Rubber is your go-to for mattresses, pillows and protectors. Their product, Dunlop Foams, contains Ultra-fresh, a proven anti-microbial compound that provides effective control of dust mites and growth of destructive mould, mildew and fungi. This means you’re placing baby (or yourself!) on the safest surfaces possible, priceless peace of mind! 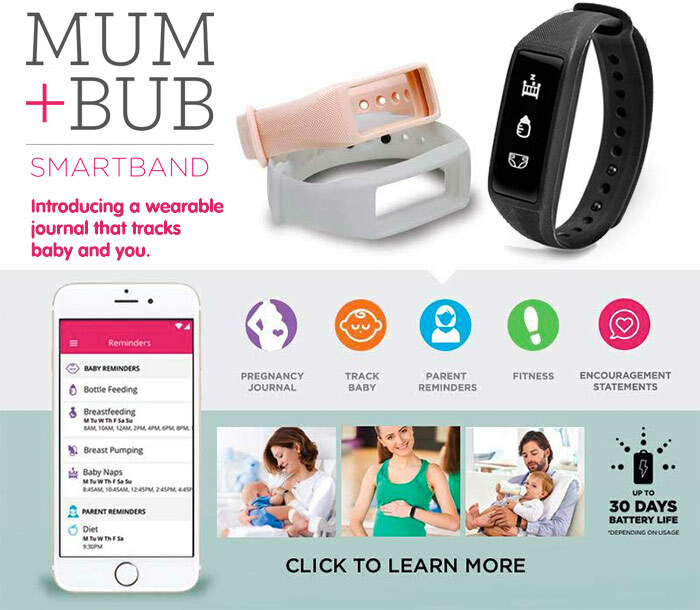 The Mum + Bub Smart Band (RRP $249.95) is one of the hottest new products around! It’s literally bringing the high-tech-smarts to motherhood to keep mother and child happy and healthy! It’s used from pregnancy onwards to track foetal movements, doctor’s appointments and more. Once baby arrives, it becomes the nanny you’ve always hoped for! In the early days of post baby fog the Mum + Bub Smart Band will remember everything – so you don’t have to! From feeding time reminders to tracking mum’s health and wellness this is a game changer for newborn life! 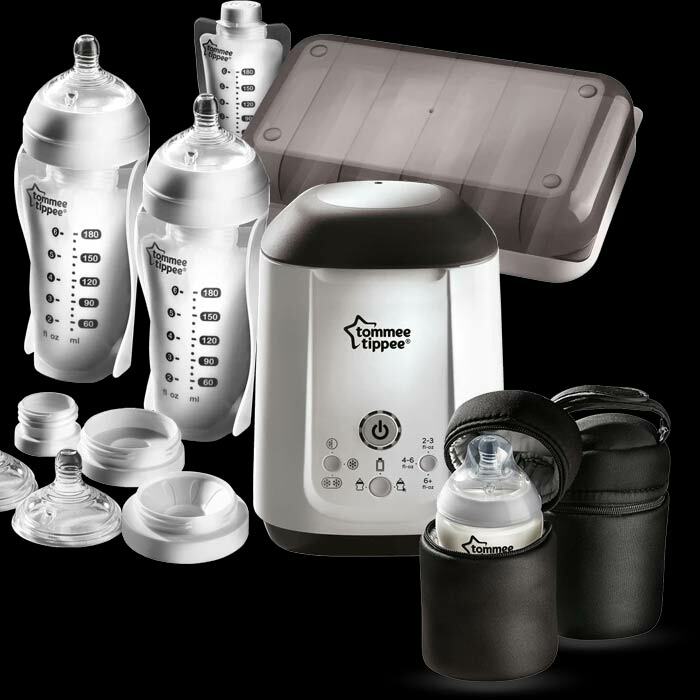 If you’re planning on breastfeeding and expressing, the Express & Go Complete Breast Milk Starter Kit (RRP $129.99) is everything you need to keep it simple! It’s cleverly designed to be compatible with all pumps and ensures you don’t waste a drop of that liquid gold! The set contains a breast milk warmer, storage case, pump adaptors, breast milk pouch bottle with teats and pre-sterilised breast milk storage pouches. The winner will also receive an additional two insulated bottle bags (RRP $29.99) perfect for taking expressed milk out and about with you. Tommee Tippee truly understands the needs of nursing mums and you’ll be 100% set to express with success if you win! So, you’re ready to win this amazing package? Of course you are! Imagine having everything you need for baby delivered to your door! Now complete the entry form below IN FULL and you’re in the running to win! This would be amazing to win! Our little bubba is a very big surprise (my other children are 12,13,16 & 18) so we had no baby things left and weren’t in a position financially to buy new things. We have been given some things from lovely friends but to have new things for our special little boy would be amazing! It would be incredible to win this prize as I’m finally expecting Baby #1. It’s been a struggle trying to fall pregnant so this would be the cherry on the cake! What an amazing prize to be won.. Would love to win for my little doll.. Fingers crossed… Good luck mommies n mommies to be..
Wow great gift for a first time mum like me. Includes all you need. Good luck to everyone entering. What an awesome prize. It would be amazing to win as I never win anything and would love to spoil my little girl when she arrives. What a fantastic prize pack!! I would love to spoil our newborn baby girl with these prizes, it’d make life so much easier not having to move her capsule to her dad’s car all the time with the seat and to put together an actual nursery for her! Fingers crossed! This would be a great present as it is not for me I am a grandmother and it is for my grandson he is 2 years old and the parents don’t have much money to help them so I would like to contribute this as a grandmother that loves her grandson. I’m going to be a grandmother soon. What a great start for my son and his wife. Wow, I’d absolutely love this prize! how amazing to get a kick start to parenting with these items?! Wow Christmas will come early with all these great baby essentials! Still need soooomany of these things!!!!! Am I stupid? I can’t find when the competition finishes and drawn. This would be amazing to win, I never win anything though, here’s to luck! It’s my first baby at 38! I’m getting married in January next year and I’ll be eight months pregnant this prize would be perfect gift to our lil family! I’m a first time mum I don’t know what to write here it’s been a full on year. Best of luck to everyone mummas are the best! This would be a perfect hamper for newborns.. This really is such a fantastic prize! What a wonderful gift you will be giving someone! Entered for my gorgeous wife. She has been eyeing off items in the give away which we just can’t afford right now. Please make me husband of the year by giving me the chance to win these phenomenal prizes! I’m a FTM, really hope that I can win the prizes as I cannot afford buying them. This pregnancy is a small surprise as my two special needs boys are around 10 years of age and I’m getting excited to very shortly find out if I will have another boy or a girl. We live on one income as I am studying full time at university after years of relief teaching and I just don’t have these things or the money to purchase good quality or brand new this time around so this would be so amazing and helpful in our house. 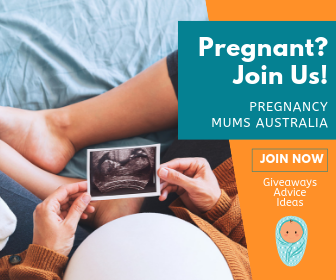 I’m due in October and this would be amazing to win! I keep checking this every single day to see if a winner has been announced. What an extraodinary prize, it will change my baby’s life, thank you for the opportunity.